Former Badger wide receiver Brandon Williams reached his NFL dream, but then he lost everything. Williams demonstrates his broadcasting chops in the Big Ten Network studio at Camp Randall Stadium. Brandon Williams ’16 always knew that his younger brother, Walt Powell, wanted to be like him. Growing up in Saint Louis, the kid — there are seven and a half years between them — followed Williams everywhere, and as the years went by, they stayed close. When ESPN’s live broadcast revealed that Williams, who had starred as a wide receiver at UW–Madison, had been picked by the San Francisco 49ers in the third round of the 2006 NFL draft, 14-year-old Powell ran into the street and shouted the news to the neighborhood. The story took a fairy-tale turn eight years later, when Powell was drafted by the Arizona Cardinals in 2014. Williams, who had been out of the league for several years by then, was thrilled that his brother would follow him to the NFL. But he was determined that there was one place Powell would never follow him: bankruptcy. A 2009 Sports Illustrated article noted that “by the time they have been retired for two years, 78 percent of former NFL players have gone bankrupt or are under financial stress because of joblessness or divorce.” Williams was part of the majority. His bankruptcy, in January 2010, while personally devastating, was hardly unique among former professional football players. In Williams’s case, there was nothing left of a signing bonus that was in the middle six figures after taxes. The houses and cars were gone, too, along with a fiancée and daughter, who moved to the West Coast. Williams hadn’t been truly reckless — but he hadn’t saved, either, and hadn’t foreseen his playing career ending after just three seasons. In the end, he’d had no financial guidance. He needed the NFL’s help to qualify for an apartment lease in Saint Louis in August 2010, but Williams didn’t draw the curtains and hide. Instead, after a brief moment of soul-searching, he went into a frenzy of activity. He lined up some paid speaking engagements, coached at camps, and reached out to the sports information director at the UW for an introduction to the Big Ten Network. And there was something else. His brother — by then a promising college football player — was on his mind, too. Williams made a deep dive into the tenets of financial literacy, reading books, scouring the internet, talking to savvy investors, and networking. “He taught himself about financial literacy,” says Stephen Johnson, a regional president with BMO Private Bank, where Williams was employed as a private wealth adviser in 2016–17, having previously worked for Northwestern Mutual. His desire to help his brother — and other athletes — navigate the choppy circumstance of being handed a lot of money in a hurry was a powerful motivator. 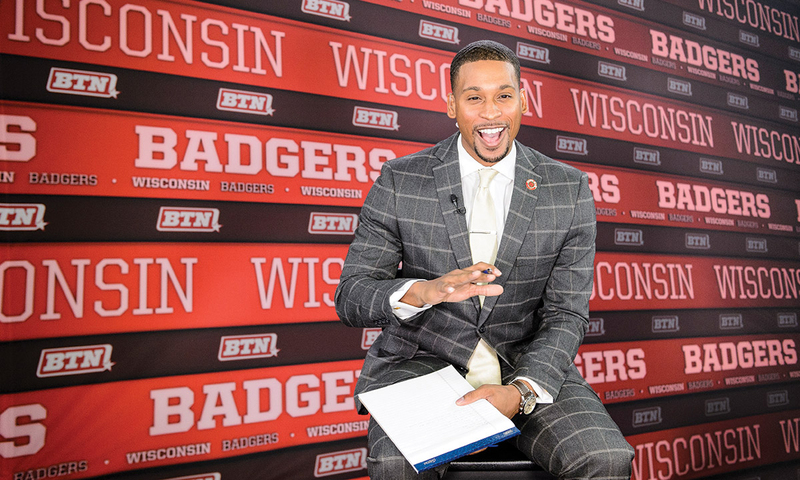 In 2015, Williams self-published a financial guide for athletes called Millionaire Mindset, and since 2010, he has worked as a studio analyst for football on the Big Ten Network. He has lived with his wife, b. Marcell Williams ’08, in Madison since 2015, when he moved back to finish his UW–Madison degree. They have four children between them. Williams left BMO — on good terms — in summer 2017, and he now works as a consultant for InitiativeOne, a leadership-training company based in Green Bay. The new role takes Williams beyond finance into all aspects of leadership development and executive coaching. It also allows more flexibility for his broadcasting duties and the increasing demand for his services as a speaker and event host. In October, Williams proved a personable and witty master of ceremonies for the Wisconsin Innovation Awards at the Memorial Union. Of course, anything Williams does will be buttressed by his hard-earned financial education. He’s given advice to younger brother Powell, who played for the Buffalo Bills after being drafted by the Cardinals and was most recently signed by the Jacksonville Jaguars to their practice squad. The extended family is big but close, and football has been there at the center, always. Williams (center) and BTN reporter Michelle McMahon (right) mingle with Badger football fans at a BTN Tailgate taping. Williams had an uncle and a close family friend who were both high school football coaches in the Saint Louis area, and he started playing youth football when he was seven. Once he started high school, he worked tirelessly, lifting weights and running passing routes for his uncle, Terrell Davis, now a high school coach in Florida. “[Brandon] had great hands,” Davis says. And by the time Williams was a junior at Hazelwood East in Saint Louis County, people were noticing. It didn’t hurt that his best friend was Hazelwood senior Scott Starks ’11, who was also a gifted athlete who later played in the NFL. They lived near one another and worked out together, sticking to a punishing routine even on hot summer days when their teammates sought air conditioning. Williams came to the UW on scholarship — as Starks had a year earlier — arriving in Madison on May 26, 2002, the day after he graduated from high school. Williams played a lot as a freshman — star Badger receiver Lee Evans III ’14 was hurt in an intrasquad game the previous spring — and never looked back. He ended his career at Wisconsin as the all-time leader in pass receptions with 202 (a record that was subsequently tied by Jared Abbrederis ’13), and he was a standout kick returner as well. His relatively small size — five-foot-nine inches, 177 pounds — kept Williams from being a first-round NFL pick. But he was confident he would be drafted somewhere, and he hosted a large party for family and friends at his mom’s house in Saint Louis on draft day in April 2006. “I don’t know,” Williams said. “What year were you born?” his aunt asked. “You will be the 84th player picked,” his aunt said. He was happy to be going to the 49ers — “I loved [49ers legend] Jerry Rice,” Williams says — but in hindsight, he feels the team never gave him a real shot as a receiver. He returned punts. A stomach virus in the off-season made for a slow start the next year, and the 49ers released him after three games. He ended up back home with the Rams in Saint Louis, even living in his mom’s new house. His time with the Rams was unremarkable, and after a failed tryout with the Steelers in 2009, Williams was out of football. He was also out of money. Among his mistakes: a $75,000 investment in a company that went nowhere. The bankruptcy filing in January 2010 was a low moment, but by June of that year, Williams had picked himself up and was headed out to New Jersey and something called NFL Broadcasting Boot Camp. 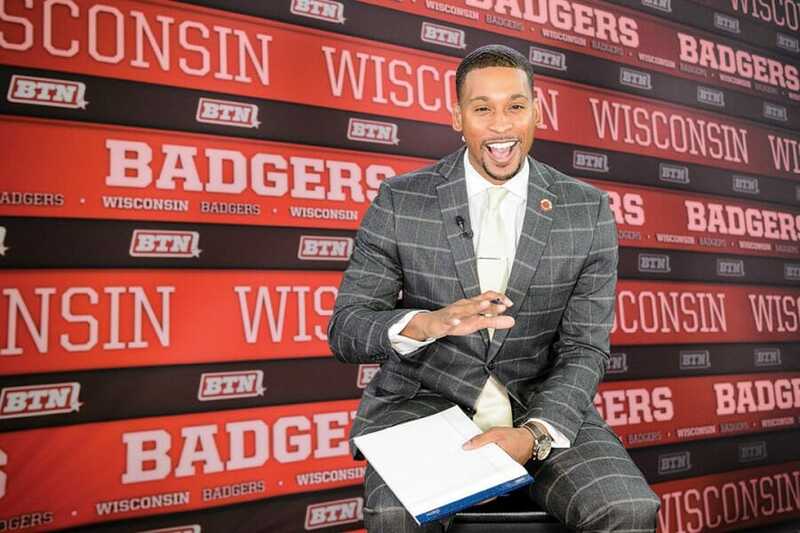 When Williams reached out to Justin Doherty MA’03, who led communications for UW Athletics, Doherty provided an introduction to Quentin Carter, a producer with the Big Ten Network. As a player, Williams did well in interviews, and he hoped to leverage that into a future in broadcasting. Williams then applied for the four-day immersion broadcasting boot camp course sponsored by the NFL’s Player Engagement office. 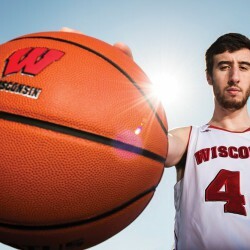 Carter, also at the camp, noted Williams’s progress and offered him a Big Ten Network spot. Williams made seven appearances in 2010, and he’s still with the network. He did 27 shows in one year alone and interviewed Alvarez at the Rose Bowl. Williams also did five seasons of pre-game shows for the Rams in Saint Louis. 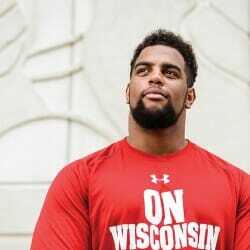 In 2015, Williams moved his family to Madison, enrolled at the UW, and completed his degree in communications. That same year he published Millionaire Mindset. Williams is now at work on a second book, tentatively titled The IIT Factor of Leadership. IIT stands for intelligence, intangibles, and toughness. He wants to see people reach their full potential. In his postfootball life, Williams has seen how it can happen, and not happen, and he feels well-positioned now to share those lessons. As for his own potential, Williams says that a decade from now, he’d love to be “running a firm that is dedicated to executive coaching and leadership transformation.” He grins. Doug Moe’s latest book, Tommy: My Journey of a Lifetime , a collaboration with Tommy Thompson on the former Wisconsin governor’s autobiography, will be published in September by UW Press.